Firebush is the name given to a series of plants that grow in the southeastern U.S. and bloom profusely with bright red, tubular flowers. But what exactly constitutes a firebush, and how many varieties are there? Keep reading to learn more about the many different firebush cultivars and species, as well as the confusion that is sometimes caused by them. What are the Different Kinds of Firebush Plant? Firebush is the general name given to several different plants, a fact that can result in some confusion. If you’d like to read more extensively about this confusion, the Florida Association of Native Nurseries has a good, thorough breakdown of it. In more basic terms, however, all types of firebush belong to the genus Hamelia, which contains 16 distinct species and is native to South and Central America, the Caribbean, and the southern United States. Hamelia patens var. patens is the variety that is native to Florida – if you live in the southeast and are looking for a native bush, this is the one you want. Getting your hands on it is easier said than done, however, because many nurseries have been known to mislabel their plants as natives. Hamelia patens var. glabra, sometimes known as African firebush, is a non-native variety that is frequently sold simply as Hamelia patens…as is its Florida cousin. 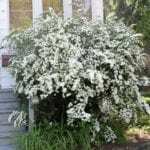 To avoid this confusion, and to keep from inadvertently spreading this non-native plant, only buy from nurseries that certify their firebushes as native. There are several other varieties of firebush that are on the market, though most of them are not native to the U.S. and, depending upon where you live, it may be ill-advised or even impossible to buy them. There are cultivars of Hamelia patens called “Dwarf” and “Compacta” that are smaller than their cousins. Their exact parentage is unknown. Hamelia cuprea is another species. Native to the Caribbean, it has reddish leaves. Hamelia patens ‘Firefly’ is another variety with bright red and yellow flowers.